Swiss criminal procedure has a strong inquisitorial tradition and its primary purpose is the search for the “material truth.” However, authorities are neither obliged nor allowed to search for this truth at any cost and are limited by procedural rules, which also serve to protect a defendant from the authorities. One possible means of enforcing such procedural rules is the exclusion of improperly obtained evidence. In Switzerland, the legislature established explicit provisions around the collection of evidence and its admissibility in criminal proceedings by adopting art. 139–141 of the Criminal Procedure Code in 2011. This is a comprehensive statutory regulation that is unique in Europe. Nevertheless, the Swiss Supreme Court continues to find ways to preserve its own power over the admission of evidence and often errs on the side of admitting evidence. With a focus on this tension between the legal framework and the jurisprudence of the Supreme Court, the Swiss country report describes the relevant legal framework, phases of the criminal process, and the relevant parties to criminal proceedings. Also discussed in detail are the current regulations as well as the Supreme Court’s case law on exclusionary rules. An assessment of the potential for such rules to safeguard individual rights and prevent improper evidence acquisition is a focus of the paper. It was not until 2011 that a unified Swiss criminal procedure code amalgamated the legal framework for criminal trials in the 26 cantons of Switzerland. Bringing together different legal traditions of continental Europe, Swiss criminal procedure is characterized by legal scholars as inquisitorial. This assessment corresponds with a traditional focus on searching for the “material truth” (or, what actually happened)1 as the primary aim of criminal proceedings.2 Today, however, the search for truth is neither an absolute goal in the Swiss criminal justice system nor do police, prosecutors, or courts have unlimited powers.3 Rather, present-day legislation acknowledges the competing interests of the State and the individuals involved and appreciates a need for them to be balanced on a case-by-case basis via legislation and, more specifically, law enforcement authorities and courts. Accordingly, Swiss criminal proceedings are characterised by formal requirements that seek to ensure a fair trial while also safeguarding individual rights and preventing abuses of power by the authorities.4 According to the theory espoused in legal texts, exclusionary rules play an important role in establishing this balance by banning the use of illegally obtained evidence and enforcing limitations in criminal proceedings.5 However, the exclusion of evidence also poses a constraint on the establishment of the material truth.6 Thus, by defining formal requirements and individual rights in criminal procedure, the legislature determines the cost of finding the material truth7—at least in theory. assess the potential of those exclusionary rules to safeguard individual rights and to prevent torture and improper compulsion in particular. Swiss criminal procedure is rooted in the inquisitorial tradition with the primary purpose of searching for the material truth. At least in theory, the proceedings aim to create a “precise reproduction of the historical incidents”23 and convict and punish defendants only for the acts or omissions for which he or she is responsible.24 The inquisitorial principle, explicitly laid out in art. 6 CPC, commits all prosecution authorities (police, public prosecution),25 as well as the courts26 to establish all relevant facts in the assessment of an alleged criminal offense in addition to an evaluation of the accused’s personal situation. Different from adversarial systems, authorities in Swiss criminal proceedings act ex officio—regardless of the parties’ conduct and requests.27 As art. 6 (2) CPC stipulates, the authorities must investigate all circumstances—exculpatory and incriminatory—with equal care, requiring them to keep an open mind throughout the investigation. The general principle of a fair trial, both in Swiss law and elsewhere, finds its origin in a variety of legal principles. Firstly, it is binding as a general principle of international law imposed by art. 6 (1) of the European Convention on Human Rights (ECHR)34 and art. 10 and 14 (1) of the International Covenant on Civil and Political Rights, Part II35 (ICCPR II).36 Second, it has been expressly codified in Swiss law in art. 29 (1) of the new Federal Constitution of 199937 and in art. 3 (2) lit. c of the new CPC.38 Article 3 (2) lit. c CPC explicitly stipulates that all persons involved in criminal proceedings should be treated equally and fairly and should be granted the right to be heard. It is also the case that the establishment of numerous strict exclusionary rules have placed greater emphasis on the forensic truth.59 For example, evidence is to be excluded in cases of incomplete or omitted warnings to the accused informing them of the proceedings against them and their legal rights (similar to the Miranda warning in the US),60 denial of an essential defense,61 procurement of evidence without regard for all parties’ participation rights,62 use of coercion to obtain evidence,63 or indirect evidence gathered as a result of previously tainted evidence.64 Art. 141 (2) CPC addresses evidence obtained through a criminal offense or the violation of so-called “regulations on admissibility” and does not establish a strict exclusionary rule, but stipulates a discretionary approach where the search for evidence and the infringement of the defendant’s rights are balanced.65 The new CPC has formalized the police’s investigative procedures and provides for a right to appeal actions by the police and prosecution.66 Additionally, regulations around the use of compulsory measures67 (i.e. those that give coercive power to the authorities and restrict individuals’ personal freedom in order to secure the establishment of the material truth) still require that the interest in finding the truth is balanced with the individual rights at risk. To achieve this balance, the CPC implemented the use of the proportionality principle,68 which requires that a sufficient, respectively strong, suspicion for wrongdoing must exist.69 Taken together, all of these aspects of the CPC place limitations on the search for the material, objective truth to safeguard the defendant’s right to a fair trial. Swiss law only partially regulates the supervision of prosecution authorities; it is, therefore, up to the cantons to decide how to “guard the guardians.” Supervision of police in routine operations is also under the auspices of cantonal law.133 Cases of alleged police misconduct can be reported to the supervisory authority134 and, where the suspicion that a crime occurred can be substantiated, police will be prosecuted. The prosecution also exercises control over the police when conducting criminal investigations. It may instruct the police in a particular way or take control of the proceedings at any time.135 Nevertheless, in practice it is difficult for prosecutorial authorities to adequately supervise police work because the CPC does not provide efficient tools to do so.136 It is clear, however, that if prosecution authorities observe a police officer improperly eliciting a confession, the officer must be reported to the appropriate authorities.137 In order to enable the prosecution and the courts to consider whether evidence has been obtained improperly, the police are obliged to continually record their findings and the means by which they have gathered evidence in a written report provided to the prosecution.138 If evidence has been obtained improperly, the public prosecutor will re-take it personally or instruct the police to do so.139 The defendant may also submit an application requesting that the official(s) in question be recused from future proceedings.140 If the case goes to court, the judges must examine whether the evidence was obtained improperly. Where the court decides to exclude certain evidence, it must re-take it.141 Theoretically, in doing this, the courts control not only the final result of the investigation, but also the police and the prosecution. The courts, as judicial authorities, also have supervisory powers, but they are limited to administrative and technical aspects unless there is a severe violation of the law. Aside from that, the errors of judicial authorities can only be challenged through legal remedies.147 Accordingly, a defendant has the right to appeal decisions, lodge complaints against the police and the prosecution,148 and appeal final judgments.149 Where the cantonal remedies have been exhausted, a defendant may appeal to the Swiss Supreme Court.150 However, according to the case law on this matter, it is not possible for a defendant to ask that his or her request for an assessment of allegedly illegally obtained evidence (and its potential exclusion) be completed before the court has received the evidence.151 This is particularly problematic as the court deciding the admissibility of the evidence will have already seen it and is also the court deciding the substantive matters of the case. In Swiss criminal investigations various institutional safeguards are in place to ensure the objectivity of investigative authorities and the transparency of proceedings. First, art. 6 (2) CPC156 stipulates that authorities must investigate all circumstances—exculpatory and incriminatory—with equal care. Second, art. 3 (2) lit. c and 107 CPC codify the right to be heard, which preserves important participation rights such as access to the criminal file, the opportunity to take part in procedural activities, the right to counsel, the right to comment on the facts and proceedings, and the right to request that further evidence be taken.157 The right to be heard also includes the right to be informed about the charge(s) as well as one’s own rights.158 All of these aspects are institutional safeguards that allow the parties to influence the fact-finding process through participation should they wish to do so.159 Hence, the “truth” is not only constructed by the prosecution authorities, but also the defense, each of whom enter into this “open process” with their own biases. In an effort to promote objectivity, art. 141 (5) CPC mandates that authorities keep an open, unbiased view of the case even where illegally obtained evidence incriminating the defendant exists. The provision states that records of inadmissible evidence shall be removed from the criminal files, kept separately until a final judgment has been reached, and then destroyed. In Switzerland, the fact-finding process prior to a trial is not public175 and the investigative work and its results are not officially published by the authorities. Instead, information is published by the media, which tend to be motivated by sensationalist news and are often inadequately informed. A study on miscarriages of justice in Switzerland found that during the period between 1995 and 2004, 237 judgments had been set aside by cantonal courts in retrial proceedings. At first sight, this does not seem to be a large number when compared to the tens of thousands of judgments handed down each year but, given that the requirements for a retrial are very strict, the actual number of miscarriages of justice is likely several times higher.182 In almost all of these cases, the contested judgment was decided in favor of the defendant.183 It is also noteworthy that 67.5% of those cases concerned summary penalty orders which, as previously mentioned, are particularly prone to error.184 This is due to the fact that summary penalty orders are issued after only a cursory examination of the facts.185 Given the nature of this approach, it is also likely that exclusionary rules are applied perfunctorily and the reliability of the evidence is, therefore, diminished. As the primary aim of criminal proceedings is to establish the truth, exclusionary rules require special justification.186 The rationale behind exclusionary rules187 is not clearly established in Swiss legal literature and case law. Three primary justifications have been proffered: to safeguard procedural rules (including individual rights), to establish the material truth, and to discipline prosecution authorities. The disciplinary component of exclusionary rules refers to the potential deterrent effect they have upon misconduct by prosecution authorities, and in particular, police officers. While in the United States this is considered to be the primary goal of exclusionary rules, the same rationale is subject to controversial debate in Switzerland.195 Some Swiss scholars reject the general applicability of this approach because the concept of disciplining prosecution authorities does not fit into the inquisitorial Swiss system where the prosecution authorities are legally obliged to gather both incriminatory and exculpatory evidence196 and are not a party to the criminal proceedings.197 However, the dominant opinion in Swiss scholarship maintains that one of the primary purposes of exclusionary rules is to render human rights violations by law enforcement unnecessary since the resulting evidence cannot be used. Thus, according to this line of reasoning, exclusionary rules also have the secondary effect of disciplining prosecution authorities.198 Since this view emphasizes the preventive rather than punitive element of exclusionary rules, its proponents argue that it is compatible with the inquisitorial Swiss criminal procedure system.199 In fact, this aspect of exclusionary rules (disciplinary measures for prosecution authorities) is one reason they are said to safeguard human rights. Therefore, one could argue that, at least with respect to the use of torture and the use of unauthorized compulsory techniques by prosecution authorities, exclusionary rules can help to (1) enforce human rights by discouraging authorities from violating human rights or by removing from trial any evidence gained in violation of human rights, and (2) establish the material truth. Evidence obtained in violation of Article 140 is not admissible under any circumstances. The foregoing also applies where this Code declares evidence to be inadmissible. Evidence that criminal justice authorities have obtained by criminal methods or by violating regulations on admissibility is inadmissible unless it is essential that it be admitted in order to secure a conviction for a serious offence. Evidence that has been obtained in violation of administrative regulations is admissible. Records relating to inadmissible evidence shall be removed from the case documents, held in safekeeping until a final judgment has concluded the proceedings, and then destroyed. A distinct provision of the Swiss CPC is art. 141 (4), which excludes indirect (or derivative) evidence that would have been impossible to obtain without the use of evidence deemed inadmissible under art. 141 (2) CPC.231 This is unique because the fruit of the poisonous tree doctrine, while typical of adversarial systems, is rarely found in inquisitorial criminal justice systems. The jurisdiction of the judge(s) of fact remains disputed by legal scholars. Some agree with the Supreme Court’s view because art. 343 (2) CPC stipulates that judges of fact are competent to re-take improperly obtained evidence during preliminary proceedings.268 This is related to the idea that judges of fact should have unrestricted access to all available evidence269 because only then can they fully evaluate the interests of all parties involved and make a determination as to whether the proceedings as a whole are fair.270 Other scholars, however, have made convincing arguments criticizing the jurisdiction of judges of fact based upon the premise that the subsequent removal of evidence from the files does not erase the judges’ knowledge of it. As a result, it is likely that they will still consider excluded evidence in their decisions,271 which significantly reduces the effectiveness of exclusionary rules. This is even more problematic when crucial incriminating evidence is involved because judges seem to have difficulty in acquitting a defendant that is apparently guilty.272 Furthermore, because exclusionary rules are binding at all stages of the judicial process, they must be considered in every procedural decision—and always with the same standards.273 This is particularly important given the fact that, practically speaking, the police exert significant influence over the fact-finding process.274 They should, therefore, also investigate exonerating evidence and potentially even implement exclusionary rules in order to effectively secure a fair trial. Thus, it seems preferable to grant defendants the right to request that evidence be excluded (and the right to appeal a denial of this request) during preliminary proceedings.275 However, the authority that judges of fact have over the application of exclusionary rules does not equate to sole control over exclusionary rules. Rather, it should be the duty of the acting authority at each stage of the proceedings (police, public prosecution, judges) to examine whether evidence must be excluded—even if in the end judges of fact view it anyway. The legal authority for the right against self-incrimination can be found in both domestic and international law. First, it is expressly codified in art. 113 CPC, which states, “The accused may not be compelled to incriminate him or herself. In particular, the accused is entitled to refuse to make a statement or to cooperate in the criminal proceedings. He or she must however submit to the compulsory measures provided for by the law.” At the international level, the right against self-incrimination is considered by the European Court of Human Rights (ECtHR) to be one of the most important components of a fair trial and is guaranteed by art. 6 (1) of the ECHR.292 It is also explicitly mentioned in art. 14 (3) lit. g of the ICCPR II. Swiss law provides several institutional measures banning torture and preserving the right to remain silent, which are included in the discussion of remedies (supervision, disciplinary, and criminal liability) above, although their enforcement is problematic due to a fragmented statutory code and restricted legal practice.308 Other legal remedies also exist309 and a large majority of the cantons have introduced a duty for doctors to report any violations of a patient’s physical or mental well-being observable to them in their medical practice.310 Within this system of safeguarding individual rights, exclusionary rules are of the utmost importance—at least in theory. The use of torture in criminal proceedings does not appear to be a major problem in Switzerland. Cases decided by the Supreme Court have primarily addressed issues around conditions of detention and imprisonment,321 not compulsory techniques in evidence gathering. Until quite recently, the question of whether evidence deemed fruit of the poisonous tree should be admissible was not clearly answered by Swiss law or jurisprudence.333 Finally, in October 2007, the Supreme Court ruled on the issue. After considering the varying arguments by legal scholars,334 the Supreme Court held that whilst the admission of indirect evidence may undermine the rules of evidence, its exclusion would hinder the search for the truth. It went on to say that the most appropriate solution is to exclude indirect evidence, but only where it could not have been obtained without the initial, direct evidence.335 This ruling was subsequently codified in art. 141 (4) CPC. Overall, the case law of the Swiss Supreme Court illustrates how the effectiveness of exclusionary rules is completely dependent upon the local practice and jurisprudence. It should also be kept in mind, however, that the Swiss legislature chose not to establish a stricter fruit of the poisonous tree doctrine,352 and instead codified the Supreme Court’s case law through art. 141 (4) CPC.353 Furthermore, the Supreme Court’s narrow interpretation of the statute up until now is limited to cases where evidence was obtained by unauthorized searches or surveillance. It is thus unclear how it will decide if and when confronted with a case of torture or the use of improper compulsory measures. If the Court elects to strictly exclude evidence in such cases, defendants will be afforded comprehensive protection. However, even if it decides to apply the limited exclusionary rule of art. 141 (4) CPC, it is still unlikely that it will admit tainted evidence as freely as it has in the past. It is the prevailing opinion that evidentiary rules in criminal procedure are the prerogative of the national legislature. As such, only a few (and rather vague)354 international guidelines on exclusionary rules exist.355 Nevertheless, international law and jurisprudence do still influence national evidentiary law and are of particular importance when defining concepts such as torture and inhuman treatment.356 Article 15 of the UNCAT implies the absolute exclusion of evidence obtained through torture and degrading treatment.357 The ECtHR has also set clear limitations on evidence taking in recent cases and has held that the admission of evidence obtained through torture is strictly prohibited as violative of art. 3 ECHR.358 However, the ECtHR has not taken a similar path with respect to the exclusion of evidence gathered by inhuman treatment359 or indirect evidence acquired through torture.360 In these cases, the ECtHR appears to be more likely to exclude evidence where the offense in question constitutes a less serious, victimless crime, such as a drug offense.361 Additionally, according to the ECHR, the violation of rights ensuring a fair trial such as the right against self-incrimination362 may, but do not require, that the evidence in question be excluded.363 On the contrary, the ECtHR generally limits itself to examine “whether the proceedings as a whole, including the way in which the evidence was obtained, were fair” 364 and if they conformed with art. 6 ECHR. The result is that many decisions by the ECtHR are not strictly followed by the national courts,365 thereby weakening the rights enshrined in the ECHR. 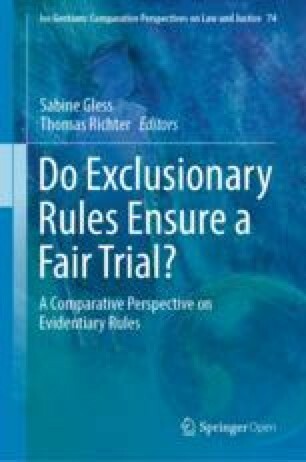 There is, unfortunately, very little empirical data evaluating the importance of fair trial principles in Swiss criminal procedure.366 This is particularly the case with regard to the practical impact of exclusionary rules. That said, a trial observation project was recently finished and included the evaluation of criminal proceedings in first instance courts in four Swiss cantons over the course of two years. The project investigated how often defense rights were asserted and how the courts dealt with those requests.367 The study was based on the observation of 439 randomly chosen368 court hearings and subsequent interviews with the parties involved (defendant, prosecution, defense counsel).369 During the project, infringements on the right to a fair trial were qualified as initiated by a party to the proceedings, initiated by the court, or exclusively observed by the project members.370 The results of this study showed that, out of 714 infringements on the right to a fair trial (initiated or observed), only 35 were related to infringements on the right against self-incrimination. Furthermore, 15 infringements were related to otherwise illegally obtained evidence that do not fall under the scope of art. 6 (1) ECHR (evidence obtained in violation of art. 3 or art. 8 ECHR). However, the infringement on rights related to other aspects of a fair trial, including the right to summon and question witnesses (113), the right to have an interpreter (104), the presumption of innocence (102) and the right to a speedy trial (98), were much more often discussed and observed.371 Furthermore, the project found that most infringements on defendant rights observed by the project members did not lead to a complaint by the defendant or the defense counsel.372 Although this data does not provide a basis for a definitive assessment, it does indicate that, in the end, the exclusion of evidence obtained in breach of the right against self-incrimination and of the prohibition on torture is of less practical importance in Switzerland than would be suggested by the level of importance given to this issue in literature. Swiss exclusionary rules look very promising as law on the books. In 2011, a far-reaching, concise statute established what appeared to be clear-cut guidelines to safeguard individual rights in criminal proceedings in Switzerland. The harmonization of the law and the clarification of exclusionary rules in a few specific cases has triggered a lively discussion among courts, defense lawyers, academics, and occasionally even the public. Practically speaking, however, the Swiss statutes face several hurdles impairing the efficiency of exclusionary rules in the Swiss criminal justice system. First, art. 141 CPC leaves open several important questions, including means of enforcing exclusionary rules and the admissibility of indirect evidence obtained following a violation of art. 141 (1) CPC. Furthermore, the wording of art. 141 CPC is vague, including terms such as “serious offence,” and “essential […] to secure a conviction.” Statutory concepts are also unclear at times, such as the distinction between “regulations on admissibility” and “administrative regulations,” as well as the hypothetical clean path analysis. These ambiguities confer a great deal of discretion upon the courts. Finally, art. 141 (2) CPC allows, under certain circumstances, the use of evidence obtained in violation of regulations on admissibility. Such regulations are of considerable importance for safeguarding individual rights and limited exclusion of evidence obtained in their violation does not provide effective protection of those rights. The problems of art. 141 CPC stem from the fact that the statute is essentially a codification of the Supreme Court’s case law. Accordingly, issues continue with the Court closing the legal loopholes and defining the vague legal terms through a longstanding and heavy emphasis on the importance of establishing the truth and prosecuting crimes. Thus, on the one hand, the Supreme Court is quite restrictive in its classification of provisions as regulations on admissibility. On the other hand, it is very quick to define an offense as “serious” or to construct a speculative (and hypothetical) clean path. The case law assigning authority to decide the admissibility of evidence to the same judge who later determines the guilt or innocence of a defendant further reduces the efficacy of art. 141 CPC. Schmid, 2017 at § 1 no. 7. See e.g., Gless/Martin, 2015 at 164 with further references. Wohlers in Donatsch et al., 2014 at art. 6 no. 2 with further references. Oberholzer, 2012 at no. 695. Wohlers in Donatsch et al., 2014 at art. 6 no. 2. Keller, 2011 at 231 et seq. Schweizerische Strafprozessordnung (StPO), officially translated as Swiss Criminal Procedure Code (CPC) of 5 October 2007 (Status as of 1 October 2016), SR 312.0, available online at <https://www.admin.ch/opc/en/classified-compilation/20052319/index.html>, accessed 22 November 2018. With exceptions, see below 3.1.3. Keller, 2011 at 234 with further references; see also below 3.1.3 and 3.2.5.2. Entscheidungen des Schweizerischen Bundesgerichts (BGE) 133 IV 329, consideration (consid.) 4.5; the decisions of the Swiss Supreme Court are available online at <http://www.bger.ch/index/juridiction/jurisdiction-inherit-template/jurisdiction-recht.htm>, accessed 22 November 2018. Schweizerisches Bundesgericht (Swiss Supreme Court, BGer) 6B_684/2012 of 15 May 2013; BGE 138 IV 169; Wohlers/Bläsi, 2015 at 169. Ruckstuhl et al., 2011 at no. 59. Militärstrafgesetz of 13 June 1927 (Status as of 1 January 2017), SR 321.0, available online at <https://www.admin.ch/opc/de/classified-compilation/19270018/index.html>, accessed 22 November 2018. Bundesgesetz über die Bundesstrafrechtspflege of 15 June 1934, SR 312.0, invalidated. Bundesgesetz über das Verwaltungsstrafrecht of 22 March 1974 (Status as of 1 Oktober 2016), SR 313.0, available online at <https://www.admin.ch/opc/de/classified-compilation/19740066/index.html>; accessed 22 November 2018. <https://www.bj.admin.ch/bj/de/home/sicherheit/gesetzgebung/aenderungstpo.html>, accessed 22 November 2018. Spelled out in detail in art. 306 et seq. and 308 et seq. CPC; see below 2.1.3.1 and 2.1.4. Spelled out in detail in art. 343 CPC; see below 2.1.3.1 and 2.1.4. Art. 6 (1) CPC; Schmid, 2017 at § 9 no. 154. Wohlers in Donatsch et al., 2014 at art. 6 no. 10 et seq. Gless in Niggli et al., 2014 at art. 139 no. 31; see below 2.1.4. Pieth, 2016 at 55 et seq. ; also BGE 124 IV 88 consid. 2.a. Schmid, 2017 at § 13 no. 229; Pieth, 2016 at 186. Pieth, 2016 at 186 with further references. Schmid, 2017 at § 13 no. 225. European Convention for the Protection of Human Rights and Fundamental Freedoms of 4 November 1950, available online at <http://www.echr.coe.int/Documents/Convention_ENG.pdf>, accessed 22 November 2018. Second Optional Protocol to the International Covenant on Civil and Political Rights of 16 December 1966, available online at <http://www.ohchr.org/Documents/ProfessionalInterest/ccpr.pdf>, accessed 22 November 2018. Brun, 2015 at 55 with further references. Swiss Federal Constitution of 18 April 1999 (Status as of 12 February 2017), SR 101, available online at <https://www.admin.ch/opc/de/classified-compilation/19995395/index.html>, accessed 22 November 2018. Schmid, 2017 at § 6 no. 95. Demko, 2007 at 356 et seq. Demko, 2007 at 360 et seq. with further references. Wohlers in Donatsch et al., 2014 at art. 3 no. 22; see in detail 2.1.1.2, 2.1.3.1, 2.1.4., 2.2.2., 3.2.1., 3.2.2. Schmid, 2017 at § 6 no. 102; also Wohlers in Donatsch et al., 2014 at art. 3 no. 22 and BGE 124 I 185 consid. 3. Schmid, 2017 at § 6 no. 99. Schmid, 2017 at § 6 no. 97. Wohlers in Donatsch et al., 2014 at art. 3 no. 24. See to the tension between material truth and justice Fornito, 2000 at 40 et seq. ; Trechsel, 2000 at 6 et seq. Demko, 2007 at 352 et seq. with further references. In detail however, there are some enforcement problems, Pieth, 2016 at 96 et seq. Jackson/Summers, 2013 at 127; Bundesblatt 2006 at 1193. Art. 158 (2) CPC; Keller, 2011 at 239. Art. 131 (3) CPC; Keller, 2011 at 241 et seq. Art. 147 (4) CPC; Keller, 2011 at 243. Art. 140 (1) and 141 (1) CPC, see in detail below 3.2.4. Art. 141 (4) CPC, see in detail below 3.2.5. Keller, 2011 at 247 et seq. ; art. 393 (1) lit. a CPC. Art. 196 et seq. CPC. Spelled out for instance by art. 197 (1) lit. c CPC (principle of necessity), and art. 221 (1) CPC (exclusion of custody for minor offences), Pieth, 2016 at 132. Pieth, 2016 at 132 et seq. in detail Thommen, 2013 at 249 et seq. Brun, 2015 at 98 et seq. Pieth, 2016 at 249 and 251 with further references; also Gilliéron/Killias, 2007 at 381 who speak of 76% according to a study from 2002 and Schweizer, 2013 at 1388 who speaks of 95%. Keller, 2011 at 249; also Gilliéron/Killias, 2007 at 389. However, recent reform efforts plan to introduce the mandatory interrogation of the defendant in some cases, e.g. before issuing a penalty order for over 4 months of imprisonment, see art. 352a of the preliminary draft regarding a reform of the CPC submitted by the Swiss Federal Council in December 2017, available online at <https://www.bj.admin.ch/dam/data/bj/sicherheit/gesetzgebung/aenderungstpo/vorentw-d.pdf>, accessed 22 November 2018. However, recent reform efforts plan to extend this period to 20 days in cases where the prosecution did not hand over the penalty order personally, see art. 354 (1ter) of the preliminary draft regarding a reform of the CPC submitted by the Swiss Federal Council in December 2017, available online at <https://www.bj.admin.ch/dam/data/bj/sicherheit/gesetzgebung/aenderungstpo/vorentw-d.pdf>, accessed 22 November 2018. Art. 354 et seq. CPC; Gilliéron/Killias, 2007 at 390 et seq. 67.5 % of all discovered miscarriages of justice between 1995 and 2004 concerned wrong summary penalty orders, see Gilliéron/Killias, 2007 at 378 et seq. Gilliéron/Killias, 2007 at 388 et seq. Art. 358 et seq. CPC; Keller, 2011 at 254. Brun, 2015 at 100 et seq. with further references; dissenting as far as fact bargaining is concerned Schwarzenegger in Donatsch et al., 2014 at art. 358 no. 6 et seq. with further references. Brun, 2015 at 107 et seq. Thommen, 2013 at 250, 309. Thommen, 2013 at 292 et seq., which the CPC neglects to do, Thommen, 2013 at 81 (as to the summary penalty order). Thommen, 2013 at 224 et seq. Pieth, 2016 at 187 et seq. with further explanations to the question of whether means of evidence other than those mentioned in the CPC are admissible or not. Schmid, 2017 at § 2 no. 15; art. 308 et seq. CPC. Pieth, 2016 at 218; critical Brun, 2015 at 98 et seq. ; Riklin, 2016 at 493 et seq. Gilliéron/Killias, 2007 at 394 et seq. However, recent reform efforts plan to introduce the mandatory interrogation of the defendant in some cases, e.g. before issuing a penalty order for over 4 months of imprisonment, see art. 352a of the preliminary draft regarding a reform of the CPC submitted by the Swiss Federal Council in December 2017, available online at <https://www.bj.admin.ch/dam/data/bj/sicherheit/gesetzgebung/aenderungstpo/vorentw-d.pdf>, accessed 22 November 2018. Riklin, 2016 at 495 who is critical of the fact that the prosecution is the sole issuing authority, acting without participation of an independent court. As to the problems concerning the supervision of the prosecution, see below 2.1.3.2. Schmid, 2017 at § 2 no. 18. Critical Pieth, 2016 at 51 et seq. ; art. 343 (3) CPC. Art. 330 (2) CPC; critical Pieth, 2016 at 51 et seq. Art. 343 (1 and 2) CPC. Art. 351 (3) and art. 84 (1–3) CPC. Schmid, 2017 at § 16 no. 308; also art. 389 (1) CPC. Gless in Niggli et al., 2014 at art. 141 no. 35. Keller, 2011 at 233 et seq. Keller, 2011 at 234, see also below 3.1.3, 3.2.4.2, 3.2.5.2. Pieth, 2016 at 67 et seq. Art. 306 (1 and 2) CPC. Pieth, 2016 at 68 et seq. Gilliéron/Killias, 2007 at 383 with further references. However, recent reform efforts plan to introduce the mandatory interrogation of the defendant in some cases, e.g. before issuing a penalty order for over 4 months of imprisonment, see art. 352a of the preliminary draft regarding a reform of the CPC submitted by the Swiss Federal Council in December 2017, available online at <https://www.bj.admin.ch/dam/data/bj/sicherheit/gesetzgebung/aenderungstpo/vorentw-d.pdf>, accessed 22 November 2018. Gilliéron/Killias, 2007 at 394 et seq. Art. 16 (1 and 2) CPC. Art. 310, 319 et seq. CPC. Pieth, 2016 at 70 et seq. Custody, preventive detention and bank account monitoring can only be ordered by the court; the other measures simply need an approval by the court; Pieth, 2016 at 73 with further references. Schmid, 2017 at § 3 no. 18 et seq. Art. 354 et seq. CPC. Pieth, 2016 at 57 et seq. “Verfahrensleitung”, in the official English translation of the CPC the “director of the proceedings”. See generally Wohlers/Bläsi, 2015 at 173 et seq. Depending on the canton, the supervisory authority is the superordinate department or the cantonal governing council; see Künzli et al., 2014 at 26. See Künzli et al., 2014 at 26 et seq. Art. 307 (2), 312 CPC. Ruckstuhl et al., 2011 at no. 62; as to the possible legal remedies for misconduct by police see Künzli et al., 2014 at 19 et seq. in detail. Pursuant to art. 302 CPC, Committee Against Torture (CAT) Report, 2016 at 2. Art. 308 (1), art. 311 (1), art. 312 (1) CPC. Art. 56 et seq. CPC; CAT Report, 2016 at 1. BGer 6B_690/2015 of 25 November 2015, consid. 3.4.; art. 343 (2) CPC. Schweizer, 2013 at 1381 et seq. Schweizer, 2013 at 1383 with further references; as to disciplinary measures against police officers in particular, see Künzli et al., 2014 at 57 et seq. ; see also CAT Report, 2016 at 3. Art. 393 (1) lit. a CPC. However, this possibility is of little practical relevance so far; Künzli et al., 2014 at 65 et seq. ; see also Gless in Niggli et al., 2014 at art. 140 no. 74. Art. 80 (1) Bundesgesetz über das Bundesgericht (BGG) of 17 June 2005 (Status as of 1 January 2017), SR 173.110, available online at <https://www.admin.ch/opc/de/classified-compilation/20010204/index.html>, accessed 22 November 2018. Pursuant to art. 301 CPC; CAT Report, 2016 at 1 et seq. ; as to criminal liability of police officers in detail see Künzli et al., 2014 at 32 et seq. Künzli et al., 2014 at 70 et seq. Thus, those claims cannot be asserted directly in the criminal proceedings against the official either which is incorrectly stated in CAT Report, 2016 at 3. Zürich, Vaud, Basel-Stadt, Basel-Land, Zug, Bern, Luzern, Sankt-Gallen, Rapperswil-Jona, Wallisellen, Winterthur; see CAT Report, 2016 at 2. CAT Report, 2016 at 2; also Künzli et al., 2014 at 28 et seq. Art. 107 (1) CPC. All of these rights are spelled out in detail in other provisions of the CPC. This is called “anticipated assessment of evidence” (antizipierte Beweiswürdigung), BGE 134 I 140, consid. 5.3. et seq. with further references; also art. 139 (2) and art. 318 (2) CPC as well as Bundesblatt 2006 at 1182; critical Pieth, 2016 at 44, 108 et seq. and 188 et seq. with further references; see also Gless in Niggli et al., 2014 at art. 139 no. 48 et seq., stating that apart from art. 318 (2) CPC requests for additional evidence cannot be rejected due to anticipated assessment of evidence. Art. 318 (2) CPC; art. 331 (2 and 3) CPC. Art. 101 (1) CPC; critical Pieth, 2016 at 93 et seq. And thus, only rarely “rejected”, Riklin, 2016 at 486 et seq. ; Gilliéron/Killias, 2007 at 390 et seq. Riklin, 2016 at 485; Thommen, 2013 at 94 et seq. See the enumeration in Riklin, 2016 at 495 et seq. ; see also the references on critical scholars in Schweizer, 2013 at 1387 fn. 84. Only in 5 % of the cases does the summary penalty order not become a legally binding judgment, but the case will go to court, see Schweizer, 2013 at 1380. Gilliéron/Killias, 2007 at 383 et seq. and 390 et seq. ; critical Riklin, 2016 at 485. NZZ online 5 August 2002, Ausschlaggebender Beweis darf nicht verwertet werden. Freispruch für Polizisten trotz Tatverdacht, available online at <https://www.nzz.ch/article8BGKE-1.414015>, accessed 22 November 2018. For both NZZ online 19 April 2013, Immer mehr Strafbefehle. Der Staatsanwalt als Richter, available online at <https://www.nzz.ch/zuerich/der-staatsanwalt-als-richter-1.18067194?reduced=true>, accessed 22 November 2018; also Brun, 2015 at 99 et seq. with further references. NZZ 29 March 2016 at 9, Deals in Strafverfahren häufen sich. Kritiker befürchten, dass Beschuldigte unter Druck falsche Geständnisse ablegen. Art. 69 (3) lit. a CPC; Schmid, 2017 at § 15 no. 265. Art. 69 (1) CPC; art. 30 (3) Swiss Federal Constitution; art. 6 (1) ECHR and art. 14 (1) ICCPR II. The exceptions (for example for the proceedings of second instance and in case of prevailing interest in secrecy) are mentioned in art. 69 (3) and art. 70 CPC as well as in other particular provisions, Schmid, 2017 at § 15 no. 260 et seq. Art. 59 (1 and 2) BGG. Art. 69 (3) lit. b CPC. Art. 69 (1) CPC; Schmid, 2017 at § 15 no. 261. In case the defendant waived the right to the public pronouncement of the judgment or in case of a summary penalty order, the decisions are open for public inspection. Art. 27 (1) BGG; art. 59 (3) BGG. Media Release of the Swiss Supreme Court: „Filmaufnahmen zu öffentlichen Urteilsberatungen“ of 27 April 2016, available online at <https://www.bger.ch/files/live/sites/bger/files/pdf/de/11.5.2_15.0.0.3_01_2016_yyyy_mm_dd_T_d_14_41_15.pdf>, accessed 22 November 2018. See Gilliéron/Killias, 2007 at 388 et seq. Gilliéron/Killias, 2007 at 389; see above 2.2. However, recent reform efforts plan to introduce the mandatory interrogation of the defendant in some cases, e.g. before issuing a penalty order for over 4 months of imprisonment, see art. 352a of the preliminary draft regarding a reform of the CPC submitted by the Swiss Federal Council in December 2017, available online at <https://www.bj.admin.ch/dam/data/bj/sicherheit/gesetzgebung/aenderungstpo/vorentw-d.pdf>, accessed 22 November 2018. Gless in Niggli et al., 2014 at art. 139 no. 23. See in detail Fornito, 2000 at 51 et seq. For more on this double purpose, see Wohlers/Bläsi, 2015 at 159 with further references. BGE 131 I 272, consid. 3.2.1; also Gless/Martin, 2015 at 162 et seq. with further references. BGE 120 Ia 314, consid. 2.c. In detail Ruckstuhl, 2006 at 20 et seq. ; also Gless/Martin, 2015 at 163; Gless in Niggli et al., 2014 at art. 141 no. 6. Schlauri, 2003 at 100; but see Ruckstuhl, 2006 at 20, who claims that all influence exerted during the taking of evidence might change the content of the evidence. Fornito, 2000 at 59; Gless/Martin, 2015 at 164; Häring, 2009 at 238. Gless, 2016 at 130; Gless in Niggli et al., 2014 at art. 141 no. 6; Gless/Martin, 2015 at 163 et seq. ; also Fornito, 2000 at 59; Groner, 2011 at 135; Häring, 2009 at 238; Thommen/Samadi, 2016 at 81 et seq., 84; Vest/Eicker, 2005 at 891; Vetterli, 2012 at 456; see also the discussion in the National Council in: Official Bulletin of the National Council, Summer Session 2007 at 955 et seq. Gless/Martin, 2015 at 164 et seq. with further references. However, also the sanctioning aspect is mentioned, Vetterli, 2012 at 456 with further references. Gless, 2016 at 128 et seq. ; Gless in Niggli et al., 2014 at art. 141 no. 1; Gless, 2012 at 136. See in detail Häring, 2009 at 118 et seq. ; Gless, 2016 at 134. See the examples in Gless in Niggli et al., 2014 at art. 141 no. 5. Gless in Niggli et al., 2014 at art. 141 no. 2. See in detail to the legislative process Gless, 2007 at 401 et seq. ; Hersch, 2012 at 359, 363, 367, 371 et seq. however, explains in detail various differences between art. 141 (2) CPC and the Supreme Court’s case law. Vetterli, 2012 at 462 referring to Official Bulletin of the National Council, Summer Session 2007 at 955 et seq. See generally Gless, 2010 at 149 et seq. Recent reform efforts plan to amend art. 141 (4) CPC by extending its scope of application also to evidence inadmissible under paragraph 1 of art. 141 CPC, see art. 141 (4) of the preliminary draft regarding a reform of the CPC submitted by the Swiss Federal Council in December 2017, available online at <https://www.bj.admin.ch/dam/data/bj/sicherheit/gesetzgebung/aenderungstpo/vorentw-d.pdf>, accessed 22 November 2018. Oberholzer, 2012 at no. 702. Pieth, 2016 at 192; Schmid, 2017 at § 58 no. 793. See the enumeration in Gless in Niggli et al., 2014 at art. 141 no. 48 et seq. Gless/Martin, 2015 at 167 et seq. Gless/Martin, 2015 at 168 et seq. ; Pieth, 2016 at 194 et seq. Oberholzer, 2012 at no. 705. See in detail Hersch, 2012 at 366 et seq. ; also Gless in Niggli et al., 2014 at art. 141 no. 65 as well as the example in Thommen/Samadi, 2016 at 69 et seq. with further references; see also BGE 141 IV 417, consid. 2. Bundesblatt, 2006 at 1183 et seq. ; BGE 139 IV 128, consid. 1.6. “Designed to guarantee the smooth administration of criminal proceedings”, Thommen/Samadi, 2016 at 71; also Vest/Eicker, 2005 at 890. Gless in Niggli et al., 2014 at art. 141 no. 72; Hersch, 2012 at 368 et seq. ; Ruckstuhl et al., 2011 at no. 556; Wohlers/Bläsi, 2015 at 164 et seq., all with further references. It is particularly disputed whether a balancing approach is still possible under the terms of art. 141 (2) CPC; see Hersch, 2012 at 369 et seq. with further references; see also below at 3.3.; Ruckstuhl et al., 2011 at no. 557, however, state that the term “essential” has no independent significance. Donatsch/Cavegn, 2008 at 165 et seq. with further critical points; also Fornito, 2000 at 239 et seq. ; Gless in Niggli et al., 2014 at art. 141 no. 74; Häring, 2009 at 239 et seq. ; Keller, 2011 at 245; Vest/Höhener, 2009 at 102; Vetterli, 2012 at 463. Thommen/Samadi, 2016 at 84 et seq. ; Vest/Eicker, 2005 at 891; Vest/Höhener, 2009 at 103. Thommen/Samadi, 2016 at 85 et seq. Gless, 2010 at 157; Gless, 2012 at 140; Oberholzer, 2012 at no. 706; Fornito, 2000 at 250; Vest/Eicker, 2005 at 891; also Vest/Höhener, 2009 at 103; Vetterli, 2012 at 457; Thommen/Samadi, 2016 at 84. Vetterli, 2012 at 458 et seq. Gless/Martin, 2015 at 179 et seq. However, recent reform efforts plan to amend art. 141 (4) CPC by extending its scope of application also to evidence inadmissible under paragraph 1 of art. 141 CPC, see art. 141 (4) of the preliminary draft regarding a reform of the CPC submitted by the Swiss Federal Council in December 2017, available online at <https://www.bj.admin.ch/dam/data/bj/sicherheit/gesetzgebung/aenderungstpo/vorentw-d.pdf>, accessed 22 November 2018. Gless/Martin, 2015 at 160 et seq. BGE 130 I 126, consid. 3.2.; BGE 120 Ia 314, consid. 2.d. Wohlers/Bläsi, 2015 at 160; also Fornito, 2000 at 248 et seq. ; Häring, 2009 at 245 et seq. ; Vest/Eicker, 2005 at 890 et seq. Vest/Höhener, 2009 at 102 et seq. See in detail Häring, 2009 at 118 et seq. ; also BGE 133 IV 329 consid. 4.4., referring to exclusionary rules explicitly mentioned in a special law. Autonomous exclusionary rules provide for the exclusion of legally obtained evidence in case that other interests outweigh the interest in using the evidence, Gless in Niggli et al., 2014 at art. 141 no. 9 et seq. ; Vest/Höhener, 2009 at 98 et seq. ; Wohlers/Bläsi, 2015 at 160 and 161 et seq. See Hersch, 2012 at 363, 367, 371 et seq. BGE 130 I 126, consid. 3.2; BGE 103 Ia 206 consid. 9.b. ; BGE 96 I 437, consid. 3.b. ; Vest/Eicker, 2005 at 889, 892; Vest/Höhener, 2009 at 105 et seq. BGE 137 I 224; BGE 131 I 272 consid. 3.2.3.5 et seq. ; Vest/Höhener, 2009 at 103; Vetterli, 2012 at 460 et seq. Answering in the negative Hersch, 2012 at 361, 367 et seq., 372 with further references; also Wohlers/Bläsi, 2015 at 164 et seq. ; Häring, 2009 at 243 et seq. on the other hand, points out that the legislator wanted to establish a balancing approach, however limited. The discussion in the National Council in: Official Bulletin of the National Council, Summer Session 2007 at 955 et seq. ; also Vetterli, 2012 at 462; Hersch, 2012 at 367 et seq. ; Vest/Höhener, 2009 at 107. See in detail Vest/Höhener, 2009 at 95 et seq. ; also Hersch, 2012 at 358; Keller, 2011 at 234; Vetterli, 2012 at 458. Vetterli, 2012 at 458 et seq. with further references. Art. 10 (3) Swiss Criminal Code (SCC) of 21 December 1937 (Status as of 1 January 2017), available online at <https://www.admin.ch/opc/en/classified-compilation/19370083/index.html>, accessed 22 November 2018. BGE 137 I 218, consid. 2.3.5.2.; the recent cantonal decision of the Kantonsgericht Schwyz, Strafkammer, of 20 June 2017, STK 2017 1, consid. 4.b. Gless/Martin, 2015 at 178 (referring to BGE 138 IV 169), 179 et seq., with further references. Wohlers/Bläsi, 2015 at 169; regarding the jurisprudence on the exclusion of indirect evidence, see below 3.2.5.2. Wohlers/Bläsi, 2015 at 164; also Gless, 2010 at 156; Gless, 2012 at 139; Gless in Niggli et al., 2014 at art. 141 no. 74; Vest/Höhener, 2009 at 102. See, for instance, BGE 141 IV 423, consid. 3 regarding the legal instruction of judicial experts. BGE 139 IV 128, consid. 1.7.; see also the examples in Gless in Niggli et al., 2014 at art. 141 no. 74. Thommen/Samadi, 2016 at 71; Wohlers/Bläsi, 2015 at 166. For instance, BGer 6B_1025/2016 of 24 October 2017, consid. 1; BGer 6B_656/2015 of 16 December 2016, consid. 1; BGE 141 IV 220, consid. 5. Vetterli, 2012 at 455 et seq. Depending on the canton, the instance and the case, the court can consist of a single judge, three or five judges, Oberholzer, 2012 at no. 99 et seq. ; art. 19 (2) CPC, art. 395 CPC. See generally Geisselhardt, 2014 at 300 et seq. BGE 141 IV 289, consid. 1.2.; BGer 1B-179/2012 of 13 April 2012, consid. 2.4.; also BGE 120 Ia 314, consid. 2.c. et seq., saying that evidence may be excluded in the trial. In BGE 122 I 182, consid. 4.c. (a decision dating from 1996 on evidence obtained by telephone tapping), however, the SSC emphasized that in certain cases the exclusion of evidence by a court may be necessary even during the preliminary proceedings. See e.g, art. 277 CPC (on the monitoring of post and telecommunications) or art. 289 (6) CPC (on undercover investigations). BGE 141 IV 284, consid. 2.3.; BGE 141 IV 289, consid. 1.3. Hansjakob in Donatsch et al., 2014 at art. 277 no. 10, regarding art. 277 CPC on the findings of unauthorized surveillence. BGer 1B_445/2013 of 14 February 2014, consid. 1.2 et seq. ; also BGer 1B_124/2014 of 21 May 2014, consid. 1.2.3.; also BGE 122 I 182, consid. 4.c). BGE 141 IV 289, consid. 1.2.; also BGer 1B_124/2014 of 21 May 2014, consid. 1.2.4. Geisselhardt, 2014 at 301, 304, with exceptions at 305; also Groner, 2011 at 142; Oberholzer, 2012 at no. 714. However, art. 343 (2) CPC only stipulates that the court should re-take evidence in case it was improperly obtained in the preliminary proceedings, but it does not prohibit another authority to decide on the exclusion of the improperly obtained evidence. Geisselhardt, 2014 at 301, 302, 304; also Oberholzer, 2012 at no. 714. Gless in Niggli et al., 2014 at art. 139 no. 15, however, argues that only lawfully obtained evidence may be the basis for the free assessment of evidence. Geisselhardt, 2014 at 302 et seq., 304; differing, however Wohlers/Bläsi, 2015 at 171. Wohlers, 2016 at 430 et seq. ; Wohlers/Bläsi, 2015 at 169 et seq. ; also the illustration of this problem in Gless, 2013 at 346; the same argument in BGE 122 I 182, consid. 4.c. on evidence obtained by telephone tapping: “Zudem besteht stets die Gefahr, dass der einmal zur Kenntnis genommene Inhalt von Schriftstücken auch bei förmlicher Entfernung aus den Akten haften bleibt und Entscheidungen mitbeeinflussen kann. Aus Gründen eines wirksamen Grundrechtsschutzes ist es daher nach Art. 36 Abs. 4 BV geboten, dass auf entsprechenden Antrag hin die Zulässigkeit der Telefonabhörung von Gesprächspartnern des Beschuldigten und Mitbenützern des überwachten Telefonanschlusses bereits im Untersuchungsstadium geprüft wird.” Differing, however, BGE 141 IV 289, consid. 1.2. “Von diesem [dem Sachrichter] kann erwartet werden, dass er in der Lage ist, die unzulässigen Beweise von den zulässigen zu unterscheiden und sich bei der Würdigung ausschliesslich auf Letztere zu stützen.” As well as BGer 1B_124/2014 of 21 May 2014, consid. 1.2.2., differentiating, however, in consid. 1.2.3., referring to BGer 1B_445/2013 of 14 February 2014, consid. 1.2 et seq. Vetterli, 2012 at 457 et seq. Also Wohlers/Bläsi, 2015 at 174. Wohlers in Donatsch et al., 2014 at art. 141 no. 10a. Art. 339 (1) lit. d CPC; Oberholzer, 2012 at no. 714. Oberholzer, 2012 at no. 716 and BGE 138 I 97, consid. 4.2.4.; dissenting Bürge, 2017 at 324. In BGE 129 I 85, consid. 4.4., however, the SSC stated that the right to request the exclusion of improperly obtained evidence can also be asserted in appeal proceedings. See, amongst others, BGE 141 IV 289, consid. 1.1. BGer 1B_2/2013 of 5 June 2013, consid. 1.2.; BGer 1B_179/2012 of 13 April 2012, consid. 2.4.; differing Wohlers in Donatsch et al., 2014 at art. 141 no. 1 with further references. Gless in Niggli et al., 2014 at art. 140 no. 75; also art. 76 et seq. CPC; Oberholzer, 2012 at no. 699. BGer 1B_414/2012 of 20 September 2012, consid. 1.2.; BGer 1B_584/2011 of 12 December 2011, consid. 3.2. BGE 141 IV 289, consid. 2.7. Art. 398 CPC; BGE 141 IV 289, consid. 1.2.; Wohlers in Donatsch et al., 2014 at art. 141 no. 10b. Groner, 2011 at 143; BGer 6P.124/2002 of 6 October 2003, consid. 5. Oberholzer, 2012 at no. 714. Gless in Niggli et al., 2014 at art. 141 no. 121; BGE 141 IV 289, consid. 1.2.; Wohlers/Bläsi, 2015 at 174 argue that already the interim decision on the exclusion of evidence should be contestable. Häring, 2009 at 253; see also above 3.1.4. European Court of Human Rights (ECtHR), Saunders v. United Kingdom, case no. 19187/91, Judgment (Grand Chamber) of 17 December 1996, § 68. Lieber in Donatsch et al., 2014 at art. 113 no. 1. ECtHR, Saunders v. United Kingdom, case no. 19187/91, Judgment (Grand Chamber) of 17 December 1996, § 68; see also BGE 131 IV 36, consid. 3.1. Lieber in Donatsch et al., 2014 at art. 113 no. 37. In detail, however, it is quite controversial what is meant by “improper compulsion”, see e.g., Macula, 2016 at. 24 et seq. with further references. As art. 113 (1) CPC explicitly states. Art. 249 et seq. CPC. Art. 269 et seq. CPC. For a detailed definition of those methods, see Gless in Niggli et al., 2014 at art. 140 no. 32 et seq. ; Wohlers, in Donatsch et al., 2014 at art. 140 no. 3 et seq. Lieber in Donatsch et al. 2014 at art. 113 no. 44 with further references. Gless in Niggli et al., 2014 at art. 140 no. 21 et seq. Wohlers, in Donatsch et al., 2014 at art. 3 no. 5 with further references. Wohlers, in Donatsch et al., 2014 at art. 3 no. 47 et seq. and 50 with further references. Of 10 December 1984, available online at <www.ohchr.org/Documents/ProfessionalInterest/cat.pdf>, accessed 22 November 2018. Wohlers, in Donatsch et al., 2014 at art. 3 no. 48 with further references. Wohlers, in Donatsch et al., 2014 at art. 3 no. 49 with further references. Wohlers, in Donatsch et al., 2014 at art. 3 no. 50 with further references. As to the threat of torture, see ECtHR, Gäfgen v. Germany, case no. 22978/05, Judgment (Grand Chamber) of 1 June 2010, § 65, 69. See above 3.1.2 et seq. and below 3.2.4 et seq. See above 2.1.3.2 et seq. In the other cantons, the doctor must previously seek to be released from his or her duty to maintain secrecy; see CAT Report, 2016 at 2 et seq. Künzli et al., 2014 at 6 et seq. with further references. Art. 10 (3) CPC, see above 2.1.1.1. See art. 78a of the preliminary draft regarding a reform of the CPC submitted by the Swiss Federal Council in December 2017, available online at <https://www.bj.admin.ch/dam/data/bj/sicherheit/gesetzgebung/aenderungstpo/vorentw-d.pdf>, accessed 22 November 2018. BGE 90 I 29, consid. 5.b. BGE 109 Ia 273, consid. 7. BGE 118 Ia 28, consid. 1.c. Macula, 2016 at 51 et seq. ; see also, for instance, BGE 142 IV 207, consid. 8 et seq. ; BGE 140 II 384, consid. 3. BGE 141 I 141; BGE 141 IV 423; BGE 140 I 246, consid. 2.4.2.; BGE 139 IV 41. Gless/Martin, 2015 at 161 with further references. BGer 6B_211/2009 of 22 June 2009, consid. 1.4.2.; BGE 134 IV 266, consid. 5.3.; BGE 133 IV 329, consid. 4.5. See the English translation of art. 141 (4) in Wohlers in Donatsch et al., 2014 at 703. The discussion in the Council of States, in: Official Bulletin of Council of States, Winter Session 2006 at 1014: „Une preuve indirecte est également inexploitable si la première preuve a été obtenue par la violation de prescriptions qui la rend inexploitable. Il y a une exception qui découle de la dernière partie de l’alinéa 2 qui dit que la première preuve est exploitable à certaines conditions“; also Pieth, 2016 at 199 and Vetterli, 2012 at 466 both with further references. Gless in Niggli et al., 2014 at art. 141 no. 90; Ruckstuhl et al., 2011 at no. 565; Pieth, 2016 at 199; Wohlers in Donatsch et al., 2014 at art. 141 no. 14, all with further references. Gless, 2010 at 159; Gless, 2012 at 142; Häring, 2009 at 251; Pieth, 2016 at 199 with further references; Wohlers/Bläsi, 2015 at. 166 et seq. Since the unlimited exclusion would be exaggerated, see Vetterli, 2012 at 466. See art. 141 (4) of the preliminary draft regarding a reform of the CPC submitted by the Swiss Federal Council in December 2017, available online at <https://www.bj.admin.ch/dam/data/bj/sicherheit/gesetzgebung/aenderungstpo/vorentw-d.pdf>, accessed 22 November 2018. BGE 109 Ia 244, consid. 2.b. ; BGE 132 IV 70, consid. 2.6. See the references in BGE 133 IV 329, consid. 4.5. BGE 133 IV 329, consid. 4.5. Also BGE 133 IV 329, consid. 3.3.1. BGE 138 IV 169, consid. 3.3.2. Gless/Martin, 2015 at 169 et seq. BGE 133 IV 329, consid. 4.6; Ruckstuhl et al., 2011 at no. 569; Wohlers/Bläsi, 2015 at 167. Gless, 2010 at 154 et seq. ; Gless in Niggli et al., 2014 at art. 141 no. 97; Pieth, 2016 at 199 et seq. ; Ruckstuhl et al., 2011 at no. 569 et seq. ; Wohlers in Donatsch et. al, 2014 at art. 141 no. 15. BGE 138 IV 169, consid. 333. Gless, 2016 at 136; Wohlers/Bläsi, 2015 at 168, both with further references. BGE 138 IV 169, consid. 3.4.1. and 3.4.3. BGE 138 IV 169, consid. 3.4.3.; critical Vetterli, 2012 at 468; Wohlers/Bläsi, 2015 at 168. Another case where the SSC admitted indirect tainted evidence: BGer 6B_684/2012 of 15 May 2013, consid. 3.3.2. Häring, 2009 at 252 et seq. ; Ruckstuhl et al., 2011 at no. 570; Wohlers/Bläsi, 2015 at 168. Gless, 2010 at 155, 159; Gless, 2012 at 141, 143; Häring, 2009 at 253; Pieth, 2016 at 199 with further references; Vetterli, 2012 at 467 et seq. ; Wohlers in Donatsch et al., 2014 at art. 141 no. 15. BGE 137 I 218, consid. 2.4.2; see also the detailed analysis of this case in Vetterli, 2012 at 447 et seq. Also the examples on admissible and inadmissible indirect evidence in Bundesblatt 2006 at 1184. Gless in Niggli et al., 2014 at art. 139 no. 12. Gless in Niggli et al., 2014 at art. 141 no. 19. Gless in Niggli et al., 2014 at art. 140 no. 35; see above 3.2.2. Gless in Niggli et al., 2014 at art. 141 no. 15. For example, ECtHR, Gäfgen v. Germany, case no. 22978/05, Judgment (Grand Chamber) of 1 June 2010, § 131 et seq. and 167; Gless, in Niggli et al., 2014 at art. 141 no. 22; Thommen/Samadi, 2016 at 76. ECtHR, Jalloh v. Germany, case no. 54810/00, Judgment (Grand Chamber) of 11 July 2006, § 83 and 103 et seq. ; Thommen/Samadi, 2016 at 77. ECtHR, Gäfgen v. Germany, case no. 22978/05, Judgment (Grand Chamber) of 1 June 2010, § 169 et seq. ; also Gless in Niggli et al., 2014 at art. 140 no. 14 with further references. Oberholzer, 2012 at no. 700 et seq. See Macula, 2016 at 28 et seq., 56 et seq. ; Vest/Eicker, 2005 at 886. Thommen/Samadi, 2016 at 77 et seq. with further references. See, among others, ECtHR, Bykov v. Russia, case no. 4378/02, Judgment (Grand Chamber) of 10 March 2009, § 89 with further references; ECtHR, Schenk v. Switzerland, case no. 10862/84, Judgment of 12 July 1988, § 46. Gless in Niggli et al., 2014 at art. 139 no. 12. As to the problem of the reception of Strasbourg case law on criminal evidence, see also Jackson/Summers, 2013 at 114 et seq. Summer/Studer, 2016 at 45 et seq. Summer/Studer, 2016 at 51 et seq. The charts in Summer/Studer, 2016 at 60 et seq. The numbers in brackets indicate the numbers of incidents brought up or observed. Such omission might be due to lack of information on the side of the defence, especially if a defendant is not represented by a lawyer. Furthermore, formally claiming a violation of rights might not lead to a clear advantage and the defendant may even be afraid to rebuff the judges by claiming the authorities violated procedural rights. Some rights might even be law on the books only, poorly implemented in practice, which might eventually lead to a largely accepted “custom” of non-compliance. Summers/Studer, 2016 at 62 et seq. and 72. See Swiss Federal Council, Erläuternder Bericht zur Änderung der Strafprozessordnung of December 2017, at 25, available online at <https://www.bj.admin.ch/dam/data/bj/sicherheit/gesetzgebung/aenderungstpo/vn-ber-d.pdf>, accessed 22 November 2018. Swiss Federal Council, Erläuternder Bericht zur Änderung der Strafprozessordnung of December 2017 <https://www.bj.admin.ch/dam/data/bj/sicherheit/gesetzgebung/aenderungstpo/vn-ber-d.pdf>, accessed 22 November 2018. Swiss Federal Council, Vorentwurf zur Änderung der Strafprozessordnung of December 2017 <https://www.bj.admin.ch/dam/data/bj/sicherheit/gesetzgebung/aenderungstpo/vorentw-d.pdf>, accessed 22 November 2018. Swiss Federal Department of Justice and Police, ‘Examen du septième rapport périodique de la Suisse par le Comité contre la torture. Prise de position de la Suisse suite à l’adoption des observations finales par le CAT, le 13 août 2015’, (6 July 2016). [CAT Report, 2016] <https://www.google.com/url?sa=t&rct=j&q=&esrc=s&source=web&cd=4&ved=2ahUKEwiCm7Wj24bgAhVKLVAKHcspApcQFjADegQIABAB&url=https%3A%2F%2Ftbinternet.ohchr.org%2FTreaties%2FCAT%2FShared%2520Documents%2FCHE%2FINT_CAT_FCO_CHE_22382_F.pdf&usg=AOvVaw1yCr3fN0Na3Tbo9L4amFYA>, accessed 22 November 2018. Swiss Centre of Expertise in Human Rights (SCHR), Künzli, Jörg/Sturm, Evelyne/Veerakatty, Vijitha, ‘Rechtsschutz gegen polizeiliche Übergriffe. Eine Darstellung der Beschwerdemechanismen in der Schweiz’, (21 February 2014). [Künzli et al., 2014] <http://www.skmr.ch/de/themenbereiche/justiz/publikationen/missbraeuchliche-polizeigewalt.html?zur=106>, accessed 22 November 2018. Swiss Federal Council, Botschaft zur Vereinheitlichung des Strafprozessrechts of 21 December 2005, 05.092, Bundesblatt no. 6 (2006) 1085. [Bundesblatt, 2006] <https://www.admin.ch/opc/de/federal-gazette/2006/index_5.html>, accessed 22 November 2018. Swiss National Council, Official Bulletin of the National Council, Summer Session 2007. [Official Bulletin of the National Council, Summer Session 2007] <https://www.parlament.ch/en/ratsbetrieb/amtliches-bulletin>, accessed 22 November 2018. Council of States, Official Bulletin of Council of States, Winter Session 2006. [Official Bulletin of Council of States, Winter Session 2006] <https://www.parlament.ch/centers/documents/de/SR_06_12.pdf>, accessed 22 November 2018.